If you were tasked to pick an industry that has delivered market beating returns over the past few decades I’d wager that railroads wouldn’t necessarily be high up on your list. In fact, when you judge it by what I’d call its economic performance, there’s every reason to assume the railroad industry would have been a disaster zone for long term investors. First of all its share of the overall stock market and economy has plummeted over the years. At the time of the Wall Street Crash railroad stocks accounted for 12.5% of the entire market-cap of the New York Stock Exchange. Today it is a tiny fraction of that. Secondly, the actual amount of usable track in operation in the United States is also a fraction of what it was even fifty years ago as other forms of transport have become increasingly viable and common. By a number of measures it has been an industry in long-term decline. Despite the bleak economic picture painted above railroad stocks have actually put in a remarkable performance over that time. Take a brief look at Christopher Mayer’s book – 100 Baggers: Stocks That Return 100-to-1 and How To Find Them – and you’ll find the level of wealth creation there to be quite staggering. For instance, a $10,000 investment made in Kansas City Southern (NYSE: KSU) stock back in the early 1970s would have been worth a mind-bending $160 million 40-years later. 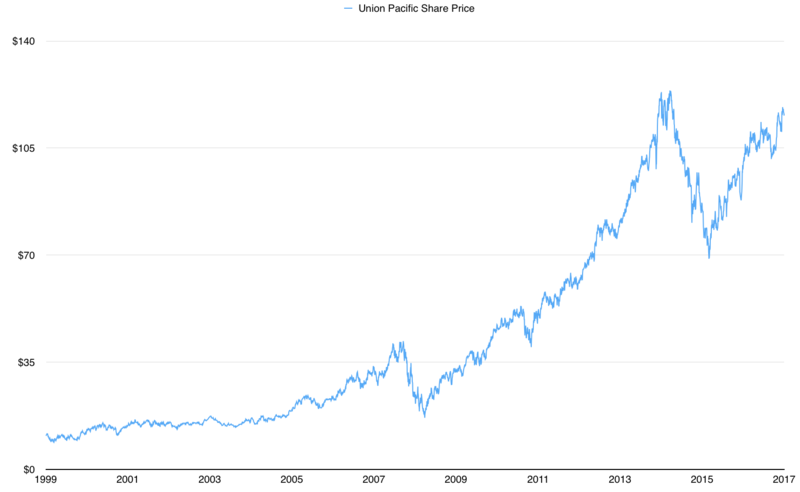 As one of the largest listed railroad companies Union Pacific Corporation (NYSE: UNP) has also delivered fantastic returns for its long term shareholders (though not quite as remarkable as Kansas City Southern). According to the data in Mayer’s book every $1 invested in Union Pacific stock at the end of calendar year 1975 was worth around $338 by 2014 – equivalent to annual returns of approximately 15.5%. Even if you had the “misfortune” to invest on the eve of the global financial crisis back in 2007 you’d have seen compound annual returns of approximately 13.5% up to the present day. Ultimately the company has a fairly simple business model. Right across America businesses need to figure out ways of transporting raw goods and finished products from A to B. Union Pacific, with its roughly 32,000 miles of track running across the Western portion of the country, represents a handy solution to that problem. In return the company charges a freight fee, which as it stands makes up the vast majority of its revenue stream. To break it down a bit further the vast majority of these freight fees are generated from six key groupings: Automotives; Intermodal; Industrial Products; Chemicals; Agricultural Products; and, finally, Coal. Now ordinarily a railroad company might not be your first port of call when looking for a good dividend stock. Firstly, and as you might imagine, these companies tend to be quite sensitive to the health of wider economy. When times are good there is more freight to haul, more fees, more revenue and more profit. When times are bad then the reverse tends to happen. Between 2008 and 2009 for instance Union Pacific saw revenue per share and earnings per share both drop by around 20%. The following year those figures then rebounded by around 25% and 50% respectively as the economy started to recover. Secondly, the railroad industry tends to be pretty capital intensive for obvious reasons. Across Union Pacific’s vast network there’s always going to be some section of track that needs maintenance work or replacement. At a cost of somewhere in the region of $600,000 per mile of track that adds up to significant level of capital expenditure that needs to be maintained each and every year. For the same reason railroad companies also tend to carry relatively large amounts of debt on their balance sheets. That said Union Pacific actually has a heck of a track record when it comes to dividends. According to the company it has managed to maintain a distribution for each of the last 118 years – a time span that includes the Great Depression no less – and the last time shareholders experienced a dividend cut was back in 1998. As you’d expect in a low interest rate world this impressive tack record has caught the eye of investors seeking out solid income and income growth stocks. You’ll find plenty of articles covering Union Pacific in the dividend and income section of Seeking Alpha for example. On that note the one point I’d be wary about is when the low payout ratio is cited as a reason for continued dividend growth. At first glance this seems like a rational observation: for example since 2007 Union Pacific has “only” paid out around 30% of net profits by way of cash dividends (though it has been getting closer to 50% in the last few years). The reason that low pay-out ratios are par for the course in this industry is for the above mentioned reasons: relatively high capital expenditure requirements, debt management and potentially volatile swings in profit depending on economic conditions. As always the crucial factor for any one-off investment will be the valuation. Where do we stand right now with Union Pacific? Well, going back to the turn of the century the stock’s average annual P/E ratio has ranged from as low as around 13.5x earnings to as high as 21x earnings. Right now the shares are trading at approximately 20.5x last year’s profits. To date the driving force behind Union Pacific’s shareholder returns has been that perfect mix of relatively high earnings growth, previously depressed valuations, a current valuation near its historical highs and, finally, a bucket load of dividends. For example over the past fifteen years shareholders have seen earnings per share grow by around 12% per annum on average. 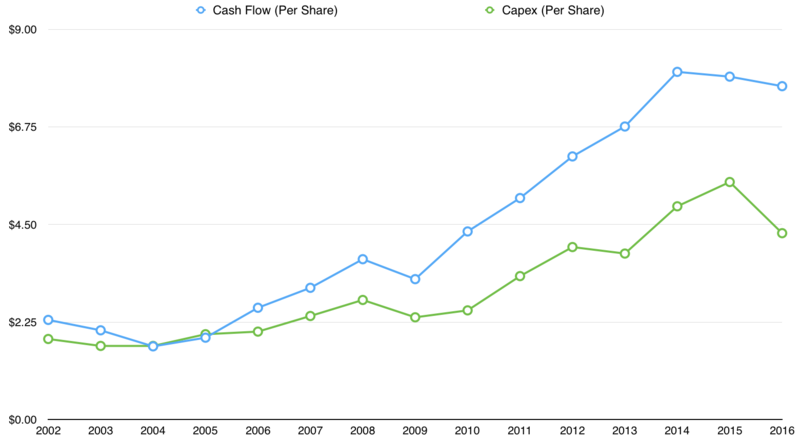 In addition the valuation multiple has expanded from around 14x earnings to 20.5x earnings. Finally, they got a pile of cash dividends totaling around 100% of the initial share price (i.e. investors would have already recouped their initial investment from cash dividends alone). Needless to say if you were a buyer of Union Pacific stock back in the early 2000s you’ve done very well for yourself indeed (it has roughly ten-bagged during that period if you include reinvested dividends). In order to determine how well Union Pacific stock might do going forward I’d just pose a few general questions. Firstly, and bearing in mind that the current valuation of 20.5x earnings is historically quite high, what will be the impact of a changing valuation multiple over any given time frame? The longer you’re prepared to wait the less important this becomes. Secondly, how will Union Pacific’s future earnings growth compare to its valuation today? In other words will future growth be able to more than offset the current valuation and deliver great returns? In the past Union Pacific investors were rewarded when that was overwhelmingly the case. Right now it is nowhere near as clear cut. As usual with these kinds of cyclical companies a recession might be a good time to take another look. Fevertree Drinks: Can The Valuation Be Justified?